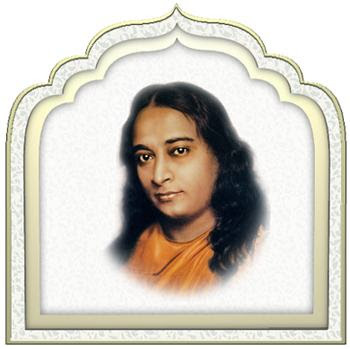 Excerpts from courtesy: www.yogananda.net website and e mails from Aarti rajdev (London) With thanks! Our dear Brother Bimalananda exited the body last night. I recall he said that when he met Master, Master spoke to him in Bengali. He asked Master why, and Master said "because we were Bengali babus (gentlemen) together before." To encourage others, he'd say that we were all Bengali brothers and sisters before. A man that lived in joy, and freely gave and inspired others with that joy. He always encouraged devotees to keep contact with Master within by constantly thinking "Om Guru" or the like. And it was him who was building Hollywood Temple when the weight he was carrying up a ladder made the ladder come away from the wall past the point of return - when Brotherji shouted "Om Guru" the ladder mysteriously returned to the wall. ps: he's the one below left - with the amazing smile! of course! tends to go down, never up. Kriya inhalation), and suddenly the whole other side would go flying!! that's not fair!" and he just laughed! chant "Om Guru" for FIVE hours! IS MORE POWERFUL THAN SHIVA!" is Divine Mother! Look! THIS one is Divine Mother!" himself would always do when his picture was being taken! picked lots of grapes, and no one got stung! have His love and protection. raisins, and he mixed it all up, and baked it. But it wouldn't set! said very casually, "Hiya, Brother B! give he man and his girlfriend a tour. disciple of Master, Brother B himself! talk to Divine Mother all day long." Brother, "I tried and tried, but I don't feel anything!" hard, YOU LOVE HER ALREADY!" neighborhood) which he never did. been drawn to him because he was feeling Divine Mother's Love and Presence. had had him repeat it, and he read it to us. so excited he got up on top of the table and was singing "O Sole Mio"
and Brother Bhaktananda was trying to get him off the table! Bimalananda, just 2 days before his passing. Once that same devotee had been asked to visit a child in the hospital, who had a hole in his heart, and a ballooning aorta, and in those days only a 5% chance (or was it 50%? --- either way is grim, right!) of surviving the operation they needed to do. So this devotee asked if Brother could come, and he came right away without any hesitation; (that family were not devotees or even religious). Brother asked for a moment of silence. A DEEP BLUE LIGHT appeared over the bed, and a great Peace descended on the room. Then Brother said, "There is a Spirit that watches over this child. There is nothing to fear." They were thanking him, but he said, "Don't thank me---it was Master." That mother wrote to Brother every Christmas, etc. for 50 years, and Brother always answered her letters. Someone said, "BROTHER KNEW HE WAS LOVED. That was his secret." A devotee came in '75 to her first Convocation. She said, "Brother could make everyone feel he was your special friend." and one on the boy when they were meditating. ANY OTHER WAY WITH DIVINE MOTHER STANDING RIGHT HERE?" Reading your stories of Brother's close friendship and healings shows me how universal his special one-on-one friendship is. I had become very sick a couple years ago. I'd seen five doctors in one week. One thought I must have AIDS because he couldn't account for what else would weaken an immune system so much. I had lesions in my mouth and down my esophagus which made eating, and even drinking anything almost impossible. I saw Brother at convocation and told him what was happening. I said "I know God is healing me." He said "What are you saying 'God is healing you'?! Your body is healed! There's nothing in there but Master's light." As he was saying "Master's light" he tapped me twice on the chest (pretty hard), right over my esophagus (even though I hadn't mentioned that was the locale of the lesions). I didn't notice anything miraculous but in that moment I was healed. The next day I was put under and biopsied and there were no more lesions. I could drink again. Eat again. Master healed me through Brother. Life sometimes seems like quite a mystery, doesn’t it? Shakespeare said, “Life is a tale told by an idiot signifying nothing.” Our job is to understand the mystery of life and to go back Home. Only that understanding will satisfy us at our very core. He was born Joseph Eugenie Carbona on May 9, 1923 in Rochester, NY. His mother was very religious and wanted to become a nun but could not raise the dowry so she married ... and had 14 children. She had a statue of Divine Mother (Mary) in her kitchen so Brother was quite used to Her presence in his life. His Dad died when he was quite young; his eldest brother was 19 yrs. older than he was. He graduated high school and was drafted in Jan. 1943, and served as a quartermaster in Normandy, selling clothes to the officers in the field. After the war, he returned to Rochester to decide what he wanted to do with his life. He went to CA for a while as his 2 older brothers, Angelo and Charlie, were there, but returned home when nothing presented itself. In NY someone gave him a book (that mentioned Master?) and he was very impressed with what he read and wrote his brother Angelo about it. Angelo then sent him a copy of the AY. When Brother first looked at Master’s picture on the cover he said, “Oh, I know him.” His brother Charlie looked at the book and said, “I know him, too!” Angelo and Charlie took the Lessons with Brother, but Master later told Brother that neither of them would remain on the path, and this proved true. When he finally met with Master, he told him, “I’ll do whatever you want me to do.” He told Master he wanted to come into the ashram that night, so Master said OK, and Brother went to Mt. Washington that night, April 17, 1948. He got Kriya about 2 months later. One day, Brother found a way to get into the restaurant after hours and eat ice cream, something he loved. A few weeks later, Master came to visit and told the monks a story about a little boy who was taking things that didn’t belong to him. Brother knew Master knew what he was doing. He looked at Master and Master suddenly disappeared and became Light. Brother stopped eating the ice cream! About 1951, Brother worked building Hollywood Temple. A fellow named Andy Anderson was in charge of the building as none of the monks knew anything about construction. The monks always were talking about how wonderful Master was to Andy. One day, Master came to visit and they all gathered round him -- even Andy -- and Master told stories. 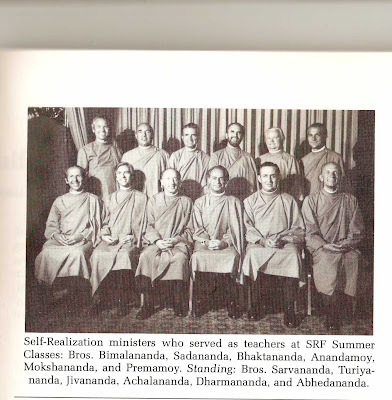 When Master left, Brother asked him what he thought of Master and Andy said, “Those were not just any stories; he was telling you all about MY life!” The next day, Andy joined SRF. One of Brother’s duties at Hollywood Temple was to mix the plaster Brother Anandamoy applied on the walls of the towers. After he’d mix up a bucket of plaster, Brother had to climb the ladder with the bucket in hand and give it to Brother Anandamoy. It was a dangerous climb and Brother accidentally missed a step and lost his balance. The entire ladder began to fall backward. Brother B. shouted out “Aum Guru,” and an invisible hand pushed the ladder mid-air back against the wall. He went to Mexico City in ‘67 - ‘76, lived there, then came back to Mother Center. Thereafter, he visited Mexico City several times a year and stayed for several weeks at a time. In Feb. 1983, he went to India for a few months and liked it so much he went back from ‘85 - 87. In ‘99, he moved to Hidden Valley. He had a tremendous love and enthusiasm for Divine Mother and the path which he shared with everyone wherever he went. This is an ascension ceremony for a dear, divine friend. His life had a special focus. We have the example of a perfect Guru; we also have the example of perfect disciples. 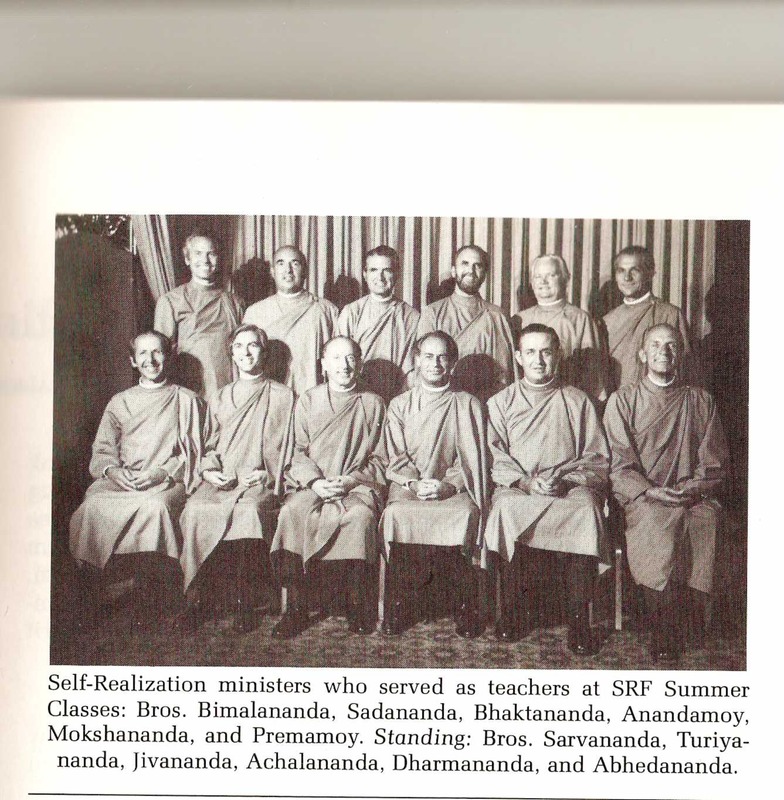 Brother was one of these examples, as are Ma, Brothers Bhaktananda and Anandamoy, Ananda Ma, Mrilini Ma, and Mukti Ma. Brother V.. was telephoned minutes after Brother B. passed and he got in the car and drove straight to Hidden Valley. Brother B. was still laying in bed; he had the sweetest smile on his face and his skin was smooth and glowed just like a little baby. The monks had put some flowers and an picture of Master on his chest. The vibration in the room was peaceful and joyous. There is no greater way to honor Brother than to emulate his qualities of dedication and loyalty to the Guru. Brother V.. has an image in his mind of a big circle of devotees around Brother B. at Convocation ... the circle would move a little bit, a few people would leave, but always in the center of the circle was Brother B. pronaming to the devotees, listening to other people’s stories, encouraging them to follow Master. For Brother B., it was always about Master, never about himself. One time in Delhi, they were invited to visit a very high class art emporium that sold the finest and most beautiful of India’s crafts. They walked through the shop for 4 hours and Brother B. touched everything, saying to Brother V., “Little Brother. Look how beautiful this is.” When they left the shop, Brother B. turned and pronamed towards the shop and said, “Divine Mother, thank You so much for giving me all these beautiful gifts, and now I give them all back to You.” Divine Mother and the guru were always foremost in his life. Many years ago he was asked to help Brother B. with his medical appointments. From that starting point, he began traveling with him to Mexico several times a year and saw his deep love for people. This was part of his uniqueness. Also his relationship with Master. Once we got lost driving back from Cuernevaca. Brother B. started to shout “Aum Guru,” and a car pulled up from the other direction, stopped, and gave them directions how to get back to Mexico City. Brother often told the story of going to an amusement park with Master. He tried to swing a hammer to make the bell ring, but couldn’t do it. Master said to him, “Concentrate.” This time when he swung the hammer, he made the bell ring. Another story he liked to tell was about the time he was having problems with another monk and he had a lot of internal criticism in his mind about this monk. He was in the desert with Master during this time and one night Master said, “Tell me about this monk.” Brother just looked at Master and said, “Master, I do not need to tell you about this because you know all about us.” Again, Master disappeared and became Light. From that time forward, Brother had no thoughts of internal criticism about anyone. Another time, Brother wrote a letter to Daya Ma and asked her about an experience he had, where he heard a woman’s voice tell him he would die when he was 86.. Brother tried to beat that challenge, but he died 10 days before his 87th birthday. Once Brother B was looking at Ma and he saw her face morph in to Master’s face. Jai Guru, read the blog with excitement of a child.had tears and smiles and laughter while going through.thank you for sharing wonderful delightful snippets.yes I have felt the power of "Om Guru" chant,now i will use it even more. Its all Guruji himself who does. Glory to our great Guru.! thank you for this. It was wonderful. I met Brother Bimilinanda at Hidden Valley a few times. He is as wonderful as you describe. When I was 13 years old I joined sunday class with dearest Bimalananda, at the Mexico City meditation centre. I remember cueing after the service to receive his blessings. Everytime he took my hands into his praying hands, I felt a strong, light, deep and wonderful vibration, full of reverence, devotion and closeness to our beloved guru. Thanks Bimalananda for your joy, your eternal smile and simplicity. I was blessed to attend the Mexico City Center in the 70's. Brother B was our minister. He was always smiling! What a gentle, kind and humble man. He did not mind doing any duty around our center. Sweeping or fixing flowers...One day I found him with the toilet off its moorings! One day he was upset that a devotee hadn't done something. Brother's idea of a strong oath was "Madre Divina!" (Divine Mother!) I feel blessed to have known him!